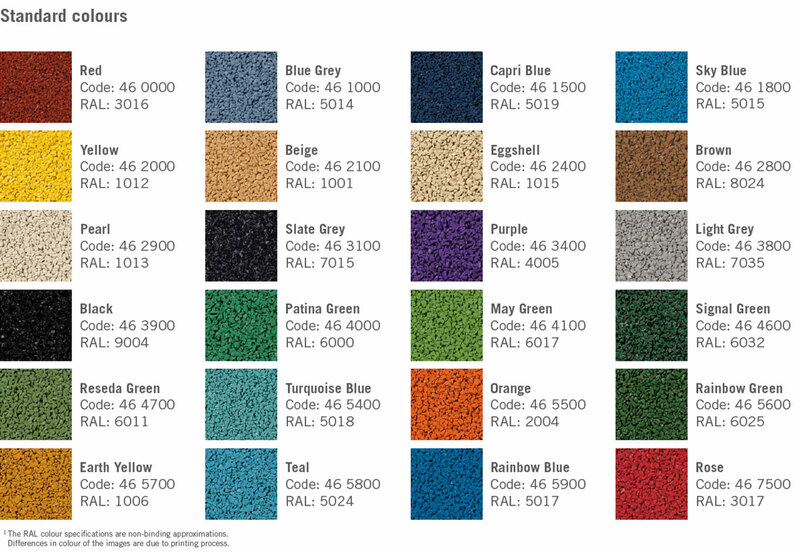 Melos develops and produces coloured and innovative system components for artificial turf pitches, running tracks, multipurpose sports fields, playgrounds and many other applications. Furthermore, our team realises customized solutions in Cable Compounds and Costumer Solutions, which are processed in the cable industry and the automotive sector. 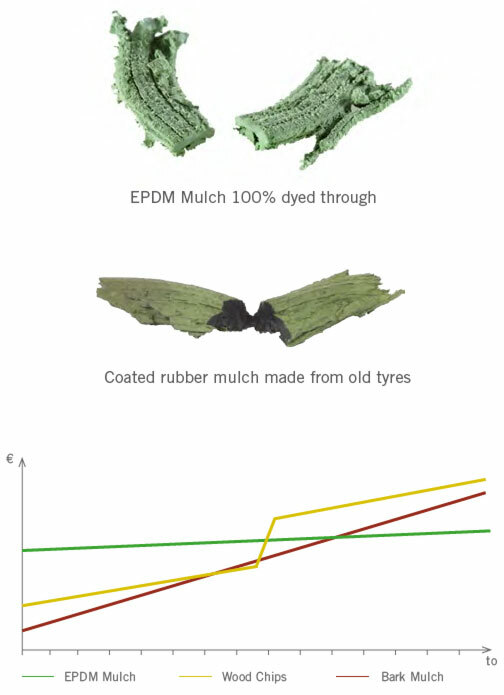 EPDM Mulch is the alternative for rubber mulch produced from old tyres with surface coating. 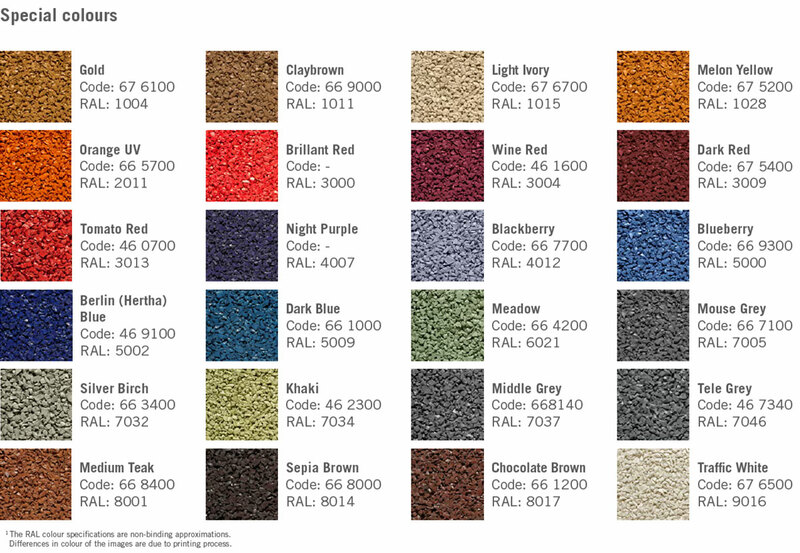 EPDM Mulch is 100% dyed through, which means it keeps its colour over the long term and is environmental and health-friendly. Bark mulch and wood chips are substantially more prone to become dirty. Soiling can be more easily covered by loose pieces of wood, or overseen during cleaning. Soiling is visible on a hardened EPDM Mulch surface and is therefore easy to clean. Bound EPDM Mulch surfaces are easier to maintain and offer a consistent level of safety. Loosely spread materials such as bark mulch and wood cuttings can rot, be removed and require substantially more care. EPDM Mulch is suitable for single-layered as well as for double-layered system constructions. Double-layered systems are installed with a shockabsorbing elastic base layer made of SBR Granules and fibres in a grain size of 1.0 – 8.0 mm. EPDM Mulch is optimally suitable for everyone who is looking for a durable, colour-resistant alternative to rubber mulch made from old tyres. EPDM Mulch is manufactured as a virgin product and is 100% dyed through. This means that its colour doesn‘t ‚wear out‘ – even after several years. EPDM Mulch doesn‘t give off disturbing odors and poses no risk to human health. Compared with natural varieties of mulch, EPDM Mulch does not rot away, it remains in place and therefore offers hygienic and consistently safe playing conditions.